How To Get Rid Of Bad Breath? Follow These Easy Steps. Home » Posts » How To Get Rid Of Bad Breath? Having bad breath can be very unpleasant for the people that surround you, and it affects you socially and health wise as well. So what causes bad breath and how to get rid of it? Bad breath, or halitosis as it is medically termed, can have a number of causes. When you have bad breath or think you have, it is advisable to contact your dentist, as it may have a medical cause. Most commonly, bad breath is caused by the gasses produced by the bacteria that have built up in your mouth. These bacteria live and grow from the food we take in and can form plaque as well as generate gasses (such as hydrogen sulfide) that smell bad. Also the food you take in itself can cause a bad odor, such as onions or garlic. And in contrary, the lack of food, for instance when you are on a diet, can also lead to bad breath. Our saliva has antibacterial properties, and having a dry mouth can therefore lead to increased bacterial growth/survival and thus a bad odor. People can have minor or severe medical conditions that lead to a dry mouth, such as Sjörgens Syndrome. It is not sufficient to just drink a bit more on a daily basis to prevent a dry mouth. What you should focus on is to minimize sugar-containing drinks, and increase the production of saliva by eating foods that require chewing, such as carrots. Read more on a dry mouth here. There are also special gums that help you to stimulate the production of saliva. Certain medical conditions can cause a bad breath, like diabetes and liver/kidney diseases. Also, people with gum diseases can experience an unpleasant odor. Gum diseases can have a medical cause but can also be caused by smoking. Getting rid of bad breath requires some actions. First of all, visit your dentist to ensure you do not have a medical condition that causes your bad breath. This is really important, as some of the conditions that lead to bad breath can be very severe and dangerous. Also, your dentist can really clean your teeth thoroughly. The place where the bacteria localize that cause bad breath is between the teeth, and on the tongue. So you can use an anti-bacterial tongue spray and tongue scraper. 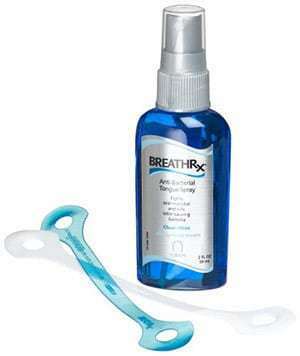 BreathRX is one of the best available on the market and they provide a tongue care kit which contains both the spray and scrapers. Every morning, spray some BreathRX on your tongue and scrape off the bacteria that have accumulated during the night. Rinse your mouth afterward. Now next to scraping, you need to brush your teeth properly twice a day, preferably using an electric toothbrush. Follow our guide on how to brush your teeth and look at our pick of best electric toothbrushes here. But brushing is not enough! Make sure to floss between your teeth once a day, preferably at night, to clean the areas between the teeth. To round it up, you can use an antiseptic mouthwash for additional care and nice smell/taste. Keep in mind that alcohol-containing mouthwashes can cause a dry the mouth, which is what you do not want! Read more on the best mouthwashes here. So Scrape, Floss, Brush! Only when you combine these three aspects on a daily basis, you can control the smell of your breath. And importantly, prevent the bad odor from coming back! What Is The Best Mouthwash For Your Oral Hygiene?